Crested Butte is one of the most iconic, authentically Western ski destinations in North America, but the residents of this tiny town are also known for doing things in the name of fun that others might consider somewhat dubious. Weird parades? Festivals involving the burning of a ginormous "Grump" effigy? Costumed nordic ski marathons? So it comes as no surprise that a moonlight cross-country ski or snowshoe trek to eat in a yurt is considered a good time here. Crested Butte is one of the most iconic, authentically Western ski destinations in North America, but the residents of this tiny town are also known for doing things in the name of fun that others might consider somewhat dubious. Weird parades? Festivals involving the burning of a ginormous “Grump” effigy? Costumed nordic ski marathons? So it comes as no surprise that a moonlight cross-country ski or snowshoe trek to eat in a yurt is considered a good time here. 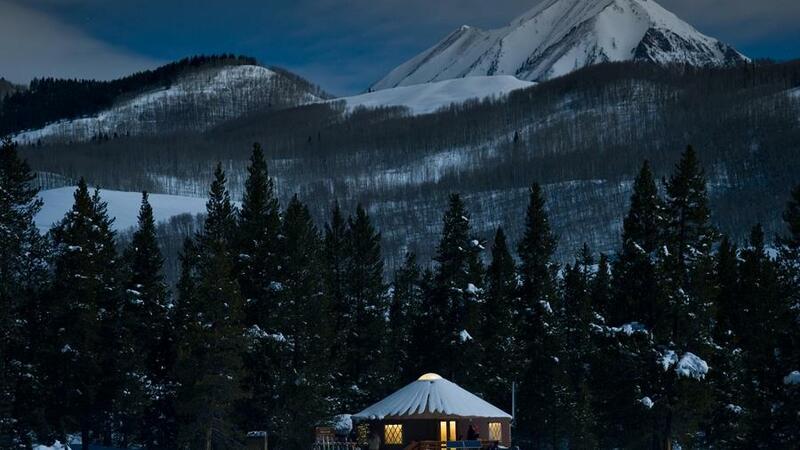 A multi-course dinner in a yurt might sound strange and, well, cold (unless you’re a self-diagnosed yurtaholic) a but “it’s a memorable experience,” says Laura Puckett of the Crested Butte Nordic Center, which started the dinners several years ago. Tiki torches light the mile-and-a-half-long trail to the yurt, where candlelight, a wood-burning stove, wine (in glasses; no janky plastic cups here), and hors’d oeuvres await. A five-course dinner follows; it’s a hell of a deal for $70 smackers (do note that booze is extra). Find a list of upcoming dinners here.